It is finished and opened. The redesign of the House of Lu started over a year ago, as Cassandra Buckalew, Cindy Lu Tam and Johnny Tam, poured over designs, ideas, took field trips, and dreamed. And then the new design was done. In one short month the creative team of the refurbishing of House of Lu totally gutted the interior and did a rebuild – that is beyond any one’s imagination and more. The elegant look is reminiscent of fine dining anywhere. 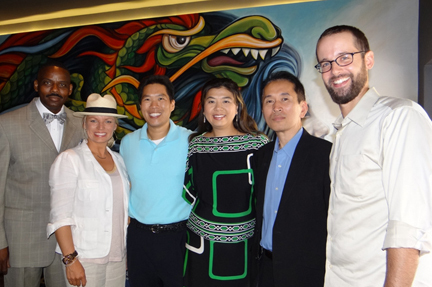 Pictured at top l-r: Francisco Dean, Project Manager, Cassandra Buckalew, Designer, Johnny Tam, Cindy Lu Tam, General Contractor Victor Maneerat and Artist Marc Noreikas. 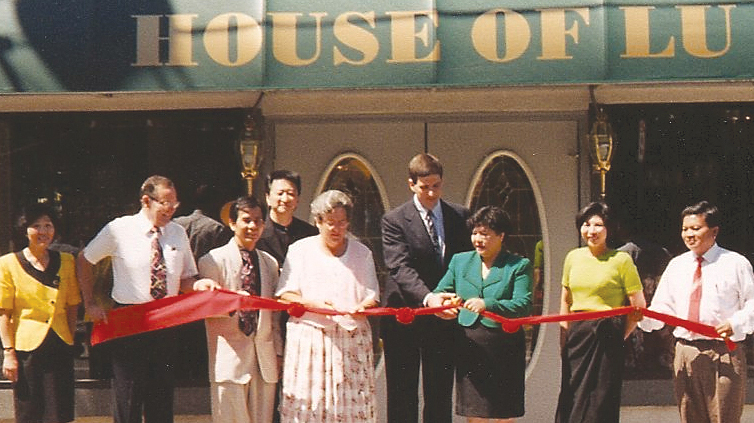 The original House of Lu was opened 18 years ago by Peter and Cindy Lu, with a ribbon cutting that included Mayor Ansley Meaders and Councilman Philip Goldstein. (See photo below). 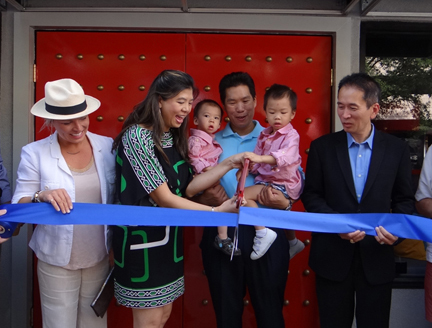 The Lu’s family’s passion for food and cooking is what started it all. Since 1995, they have served Lu’s original recipes at the original House of Lu. The Lu family are the original owners of the “ House of Lu”. No other “LU” locations are affiliated with this House of Lu or this Lu Family. Along with the refurbishing of the restaurant “Mama Lu” (Cindy Lu) has added original Vietnam recipes to the menu. Cindy Lu Tam advises that the family is Chinese, but grew up in Vietnam. With almost 3 decades of experience in the restaurant business, they proudly preserve their passion for food with their family’s recipes. They care and use the finest, freshest ingredients when serving your lunch, dinner, parties, and catering needs. Members of the Marietta Business Association, staff from the City of Marietta and family and friends were on hand when the House of Lu held their ribbon cutting on Thursday, August 7 to celebrate their grand re-opening. People were truly amazed at the transformation. The House of Lu is located in the historical district of Marietta Square, behind the Strand Theatre at 89 Cherokee St., Marietta, GA. For reservations call 770-794-8831. Dine in or delivery. Catering is available for your next family gathering or party. Let them know how their family can serve you best. Eat more healthy Chinese food. A great big thank you from the Lu family. From concept to actual! Thank you Cassandra Buckalew Interiors!! Other Contributors: Marc Noreikas (murals), The Lighting Loft (lights), Top South (bar top), T&R Fixtures (tables and veneer finishes), Florida Seating, Florworx, Cathy Brazeal, and last but not least our amazing general contractors Victor and Fransisco! We could not have made this happen without you! !